I arrived with some trepidation in Tokyo, as my previous trip I did not enjoy Tokyo at all. There was a barrier, and I felt like a lost outsider. I was “let in” while in Seoul, but not in Tokyo. Would 9 years change that? I pondered that as I jockeyed for space in the Tokyo Monorail headed towards the centre. It was a sunny and nice morning, so I walked (dragging my bag) to my hotel, which was about 15 minutes away near Shimbashi Station. Not much of an issue, but once again the Asia mantra of “you see it but you can’t get there” proved true, this time hampered also by major roadworks. After a few ramps, I finally found my hotel. I would recommend the Park Hotel Tokyo very much. Great staff, especially the concierge who sorted out some of my dinner bookings. Convenient location, spartan but good room, and 2 Michelin-starred restaurants in premises and more within a 5-minute radius. I didn’t experience much in the hotel as I had plans, but they looked good. Only drawback was the huge amount of cigarette smoke that permeated the lobby cafe from the excellent (but nauseatingly smoky) whisky bar. I took some time the first day to solidify my plans and just get acquainted with travelling in Tokyo…last time here was a nightmare for me, and I didn’t want to deal with that. Thank goodness the Suica (the local Oyster Card equivalent) was easy to acquire at Haneda, tho I put too much money on it… Made travelling so, so much easier than to buy a bloody ticket… And machine was in passabe English (learn from that, Seoul…). 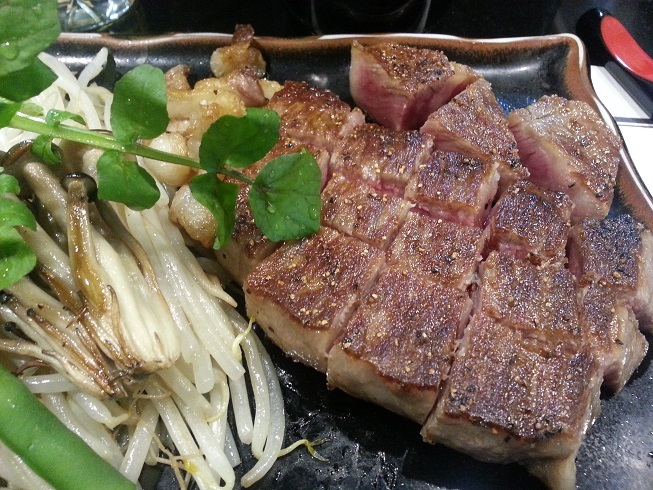 As I was quite jetlagged and still revelling in the amazing beef from Satou I took an early night. The next morning I got up and went for a long walk around Tsukiji Fish Market. The famous place hasn’t changed much since my last visit 9 years ago, but way more tourists. There were too many queues this morning for things interested, and I didn’t need to spend a wallet-full to bring home an ultra-sharp sushi knife, so I headed out after an hour or so. 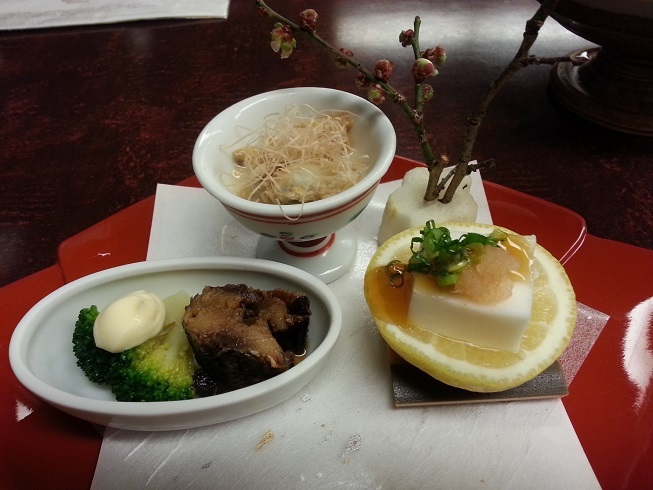 I wandered around in Ginza for a bit until I found my lunch destination, Chikuyotei. I love eel, and this was one of the best places for it in Tokyo (it used to have a Michelin, but now gone, thank goodness). I ordered the main lunch una-don special (large) but also had a quick snack at first of squid in urchin sauce…I love this dish. Despite all the drink I wasn’t too hungover after the bad sleep…jetlag trumps hangover it seems… I was knackered when I got up and headed out again. A little lazy today, and decided to stay in Ginza once more. 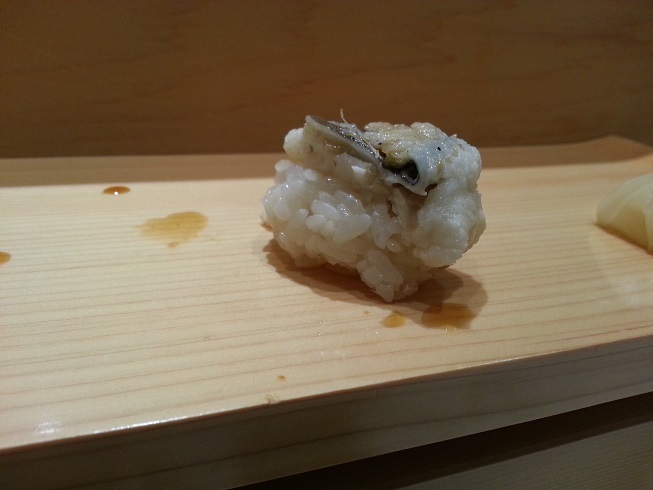 Yesterday was eel, today was tempura, and I headed to one of the best regarded tempura restaurants in Tokyo, Ten-Ichi. The first course was the shrimp, 2 pieces (sorry, overzealous, ate 1 before remembering to take a picture) including fried legs. Shrimp not big but tasty, and the batter was fantastic, fried to perfection. As everyone says, you eat tempura in Japan you’ll never be able to eat it outside again…and they are right. Wow, what a difference. 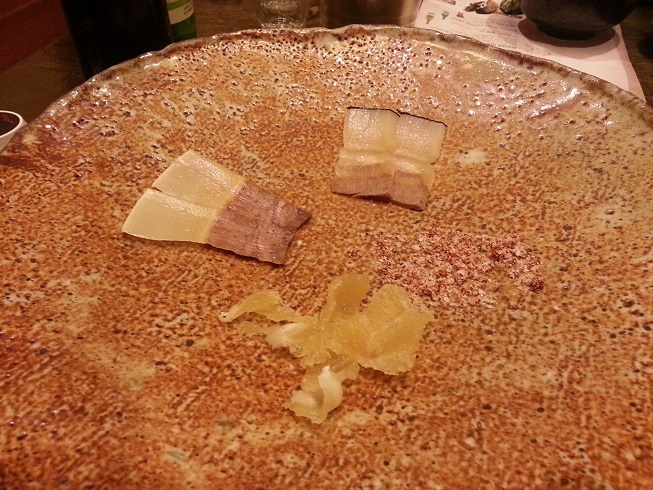 It was followed a thick slice of lotus root. Next feature was the whitefish, which was also quite tasty, fried to perfection to leave moist and burning hot flesh inside. It was followed by a rather lonely asparagus. 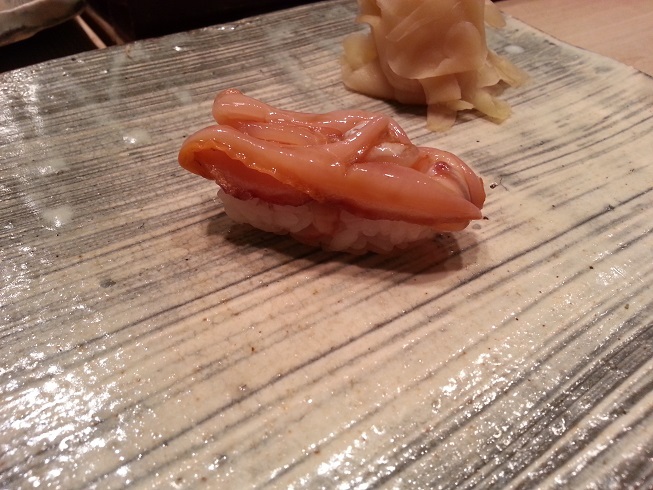 Then we got a humble piece of squid, which was a little lacking to be honest, later followed by another lonely pepper. The texture was nice fried, but the squid portion was disappointing. After that was my favourite, anago tempura, which was excellent. 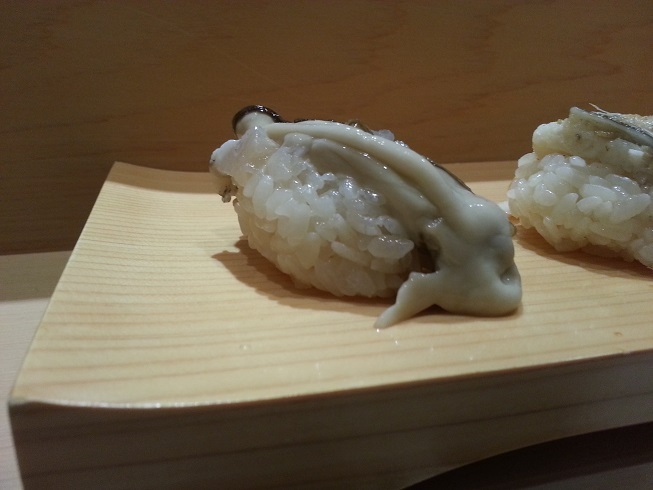 I love eel, and eel tempura was just a treat I still find hard to get in the US. And a very generous portion! This was followed by a cute baby eggplant at first, then a strange ball afterwards…turned out it was a ball of baby shrimp! Tasty! This was a rather expensive lunch, frankly, but good. It’s one of those “try it once” things as tempura is not that high up my priority list when it comes to Japanese cuisine. 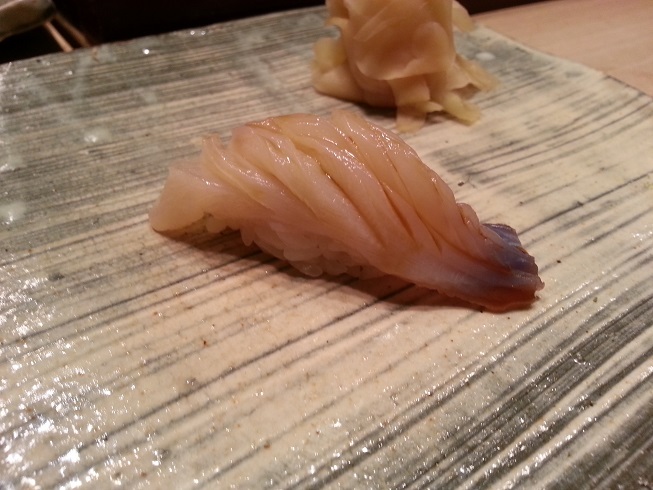 Nice, especially the anago. A good lunch. I walked around the north and west part of Ginza, dodging shoppers this weekend afternoon. These were delicious, and these were from the second night enjoying much more of them. Downed many beers and a few more servings of these delicious skewers, I was happy walking back to the hotel. The next day I checked out, but my body was really rebelling after sleeping for only 2 hours…it just wouldn’t fall asleep again after I got up at 4am or so… I just laid there like a zombie… I had decided to get a hotel near the far-flung Narita Airport as my flight the next day was early morning and didn’t want that headache. I enjoyed some more sake and the meal started with various things, including this cute starter selection of pickled clams, tofu with cod roe, and glazed sardine. Perhaps a little anti-climactic of a meal to end my Asia trip, but it was definitely necessary a climbdown from the amazing foods I’ve had all trip. It was simple and tasty, and a lot of veg — which again I need and want. I headed to the bar for a last drink, conversed in Russian with some patrons, and headed up hoping for a good night sleep before the 12-hour flight to London in the morning. My body had quit on me, which was too bad. I wish I had more energy to eat in Tokyo (and Seoul). I need to make it a focus next time I come to Asia. And yes, after this trip, I will not wait 9 years ago to come back. Food is just too good. 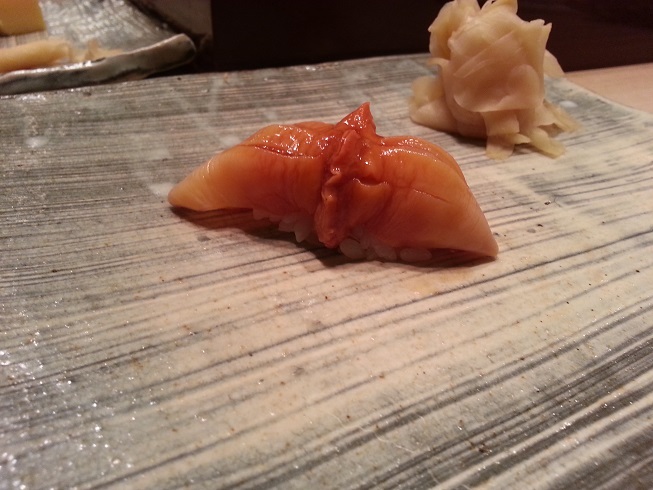 I was really starting to love Tokyo on this trip, especially after the previous night’s dinner at Sushi Bar Yasuda. However, my jetlag was getting worse, and I was still sick from the bug I picked up in Manila, so I had to really fight to get to food. As a consequence I was not eating as much as I thought I would. 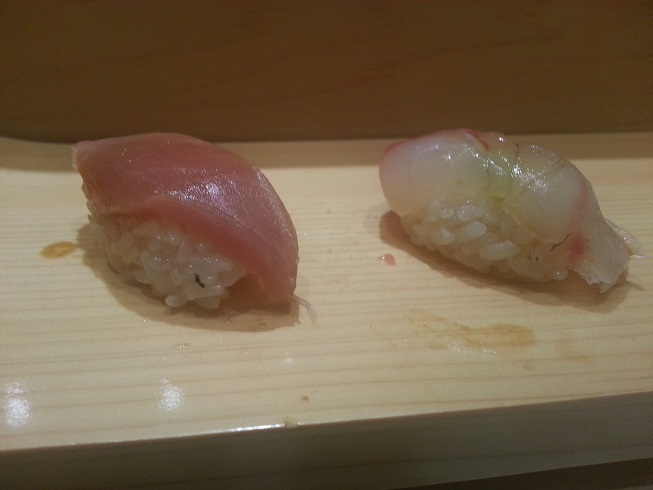 But for my last care-free night on this trip, I made arrangements to check out one of the very best sushi bars in all of Tokyo, the Michelin-starred Sushi Kanesaka. 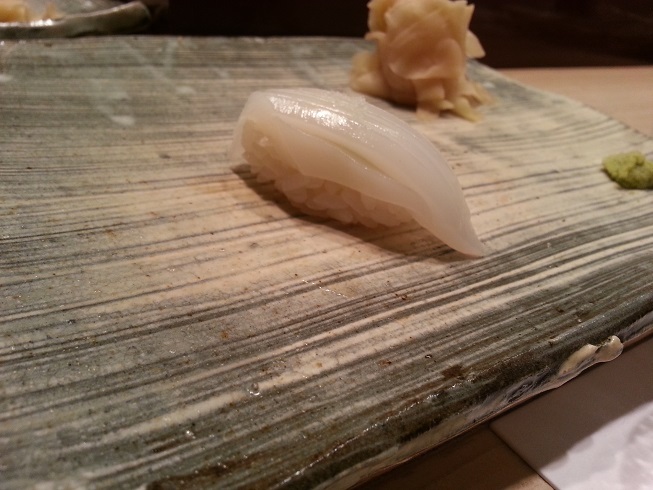 Michelin stars are kind of turn-offs for locals, but compared to Yasuda this place caters much more to the Japanese. 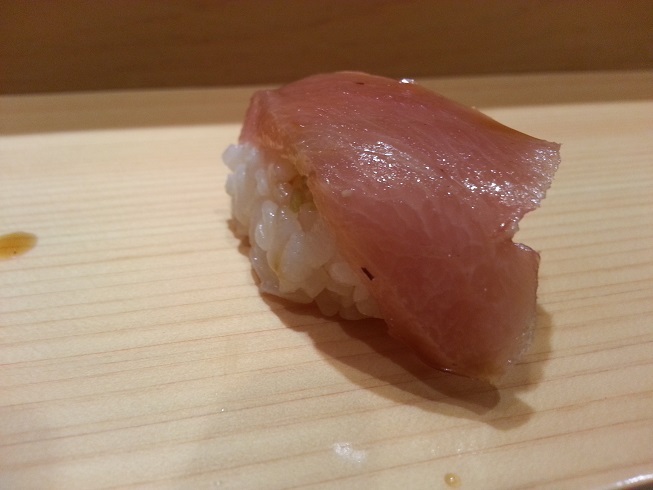 As are many other top sushi restaurants in Tokyo, Sushi Kanesaka is in the basement of an office building. 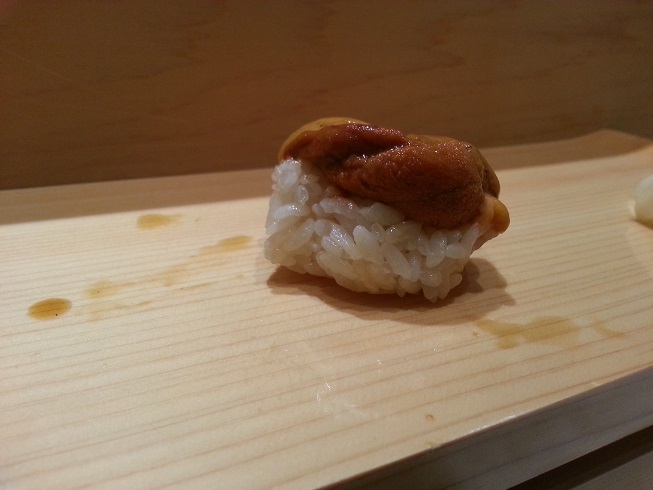 I found the non-descript place, went downstairs and found a small sushi bar divided into 2 sections. I was seated in the front section, possibly because the chef speaks decent English; of the 2 groups next to me one was Japanese and one was Korean (but spoke some Japanese). I was gonna take it slower on the sake tonight as I don’t need a hangover, so I also had a mug of tea during this omakase. Once again, another amazing experience, and I do have photos of the entire course (like the Yasuda review), so join me once again for the ride! 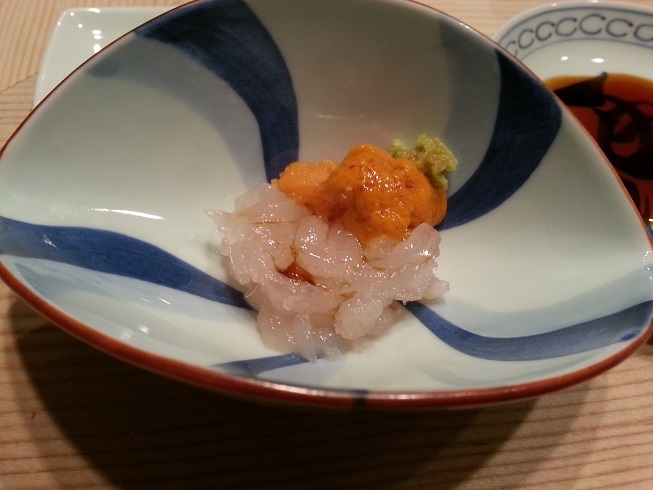 The omakase (big course) began with some baby shrimp with a generous serving of fresh sea urchin. Mmm, a nice opening, balancing the two different types of sweet from the key ingredients. Nice! 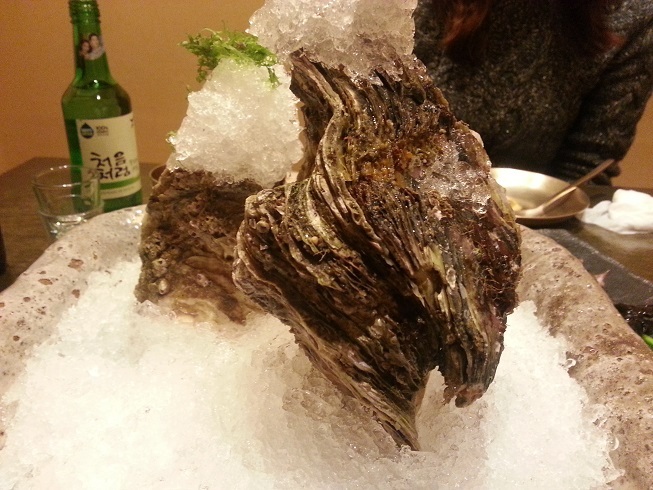 Next were two succulent oysters. Meaty, briny, these were scrumptious! So far excellent! Third up was some awesome hairy crab. 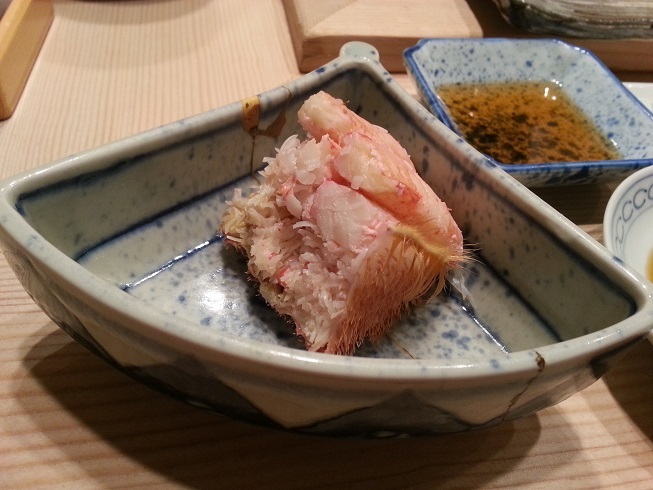 A generous portion, the savoury crabmeat was very tasty. 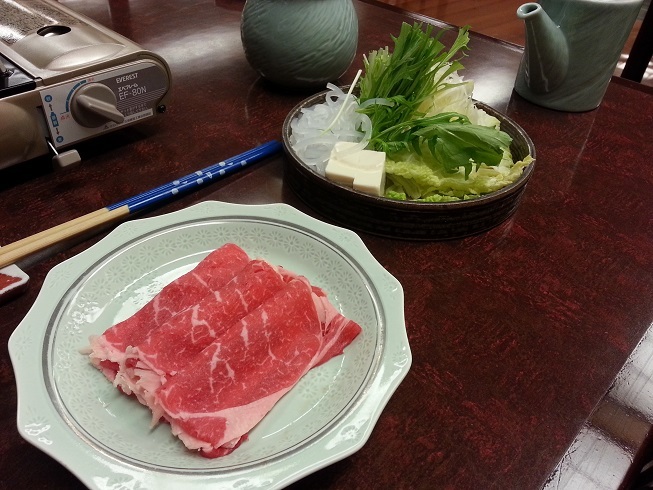 Fourth was some chu-toro to whet the appetite. 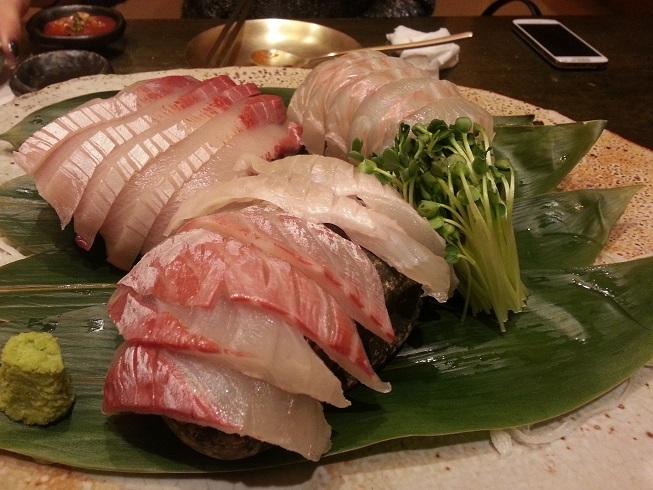 Just enough fattiness to make this sashimi a wonderful treat before we move into the sushi. 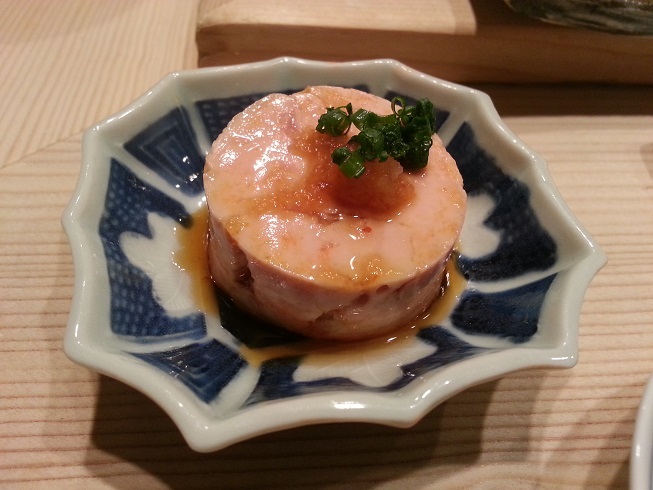 The last of the pre-sushi courses was a nice piece of grilled swordfish. Don’t see this often on Japanese menus, but it was an excellent piece of fish. 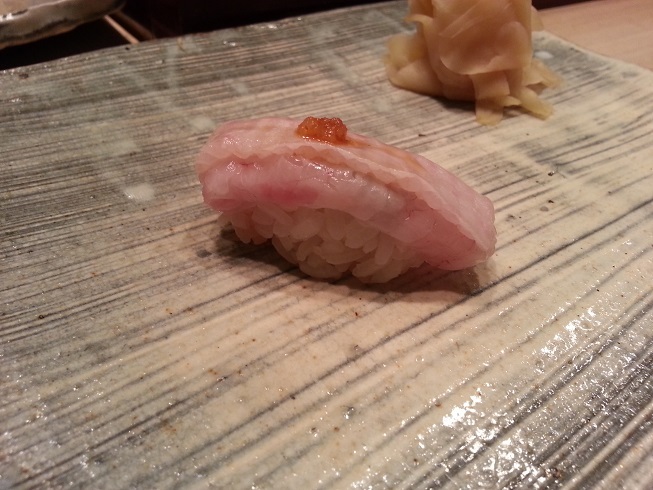 I was now really looking forward to the sushi portion of this omakase dinner! 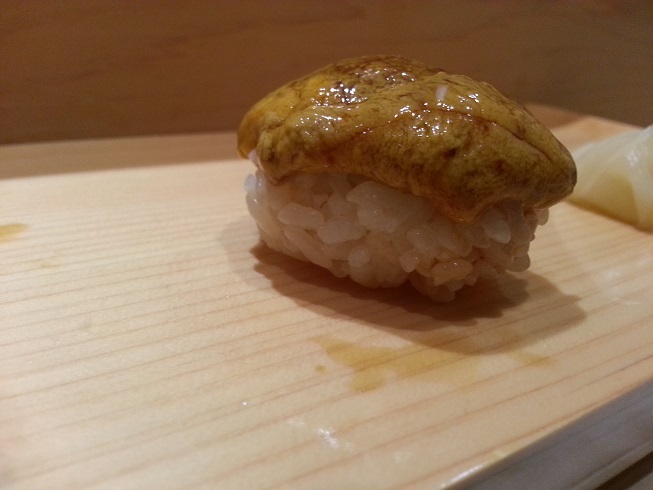 First up was hirame, or flounder. 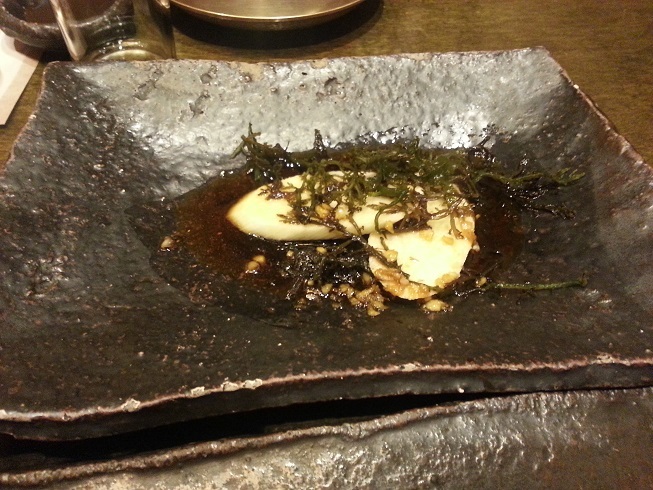 A solid piece with nice taste, but after the amazing flounder hoe I had at Seoul’s Goraebul this was a runner-up. Ironically when the Korean group asked me about my dining experience in Seoul they were utterly impressed I had found Goraebul and Congdu. 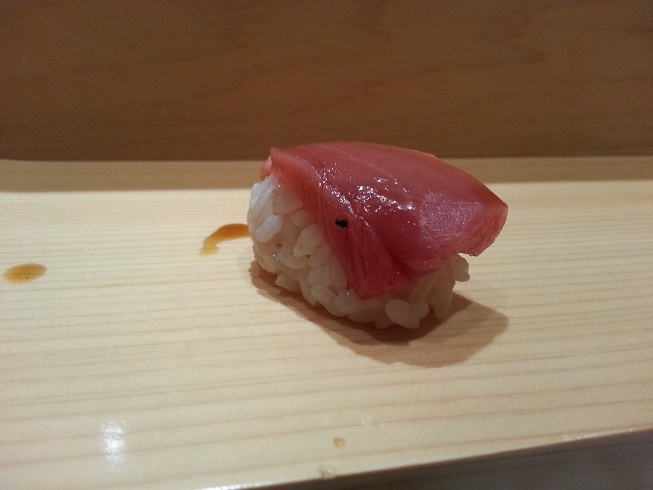 First up was the akami, or lean tuna. This was very tasty as the freshness can’t be questioned. 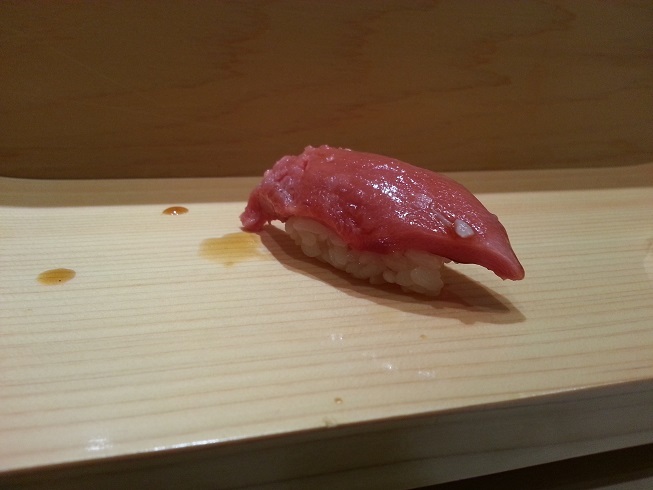 Next was the chu-toro, which was very tasty. 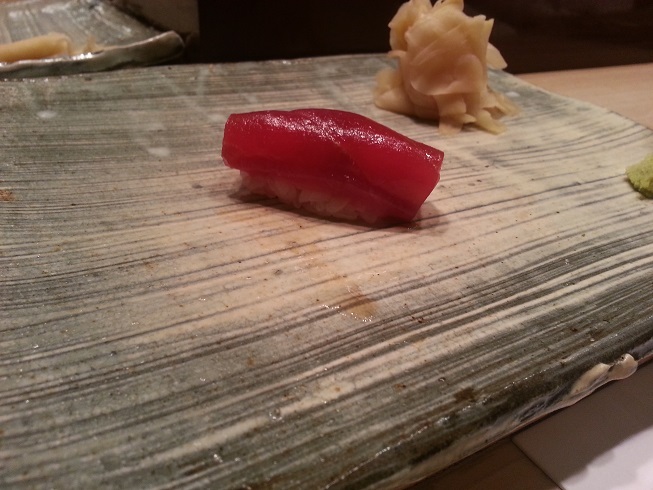 I got a sniff of this during the early courses as a sashimi, but this was fantastic. 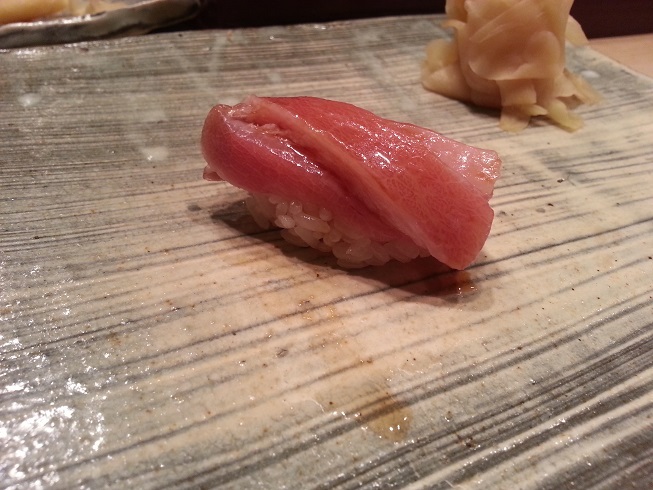 Then of course was the o-toro, which was just melt-in-your-mouth here…wow, this was stunning. 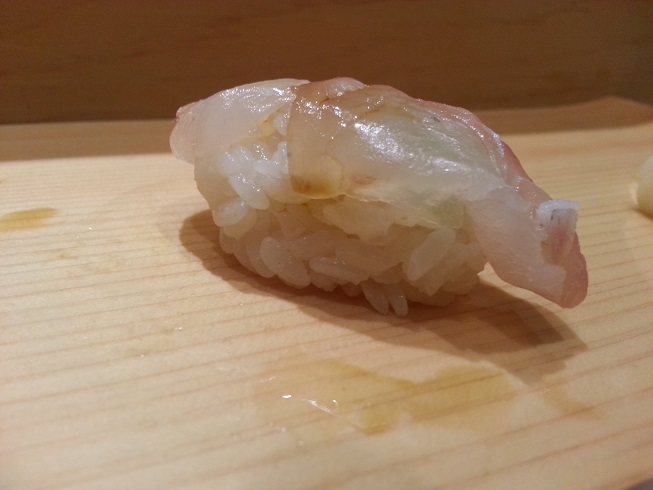 Super fresh, as the world-famous Tsukiji Fish Market is just a few blocks from here. In a change of pace the next piece was ika, or squid, one of my favourite sushi to eat. I love the texture. This was no exception, good! 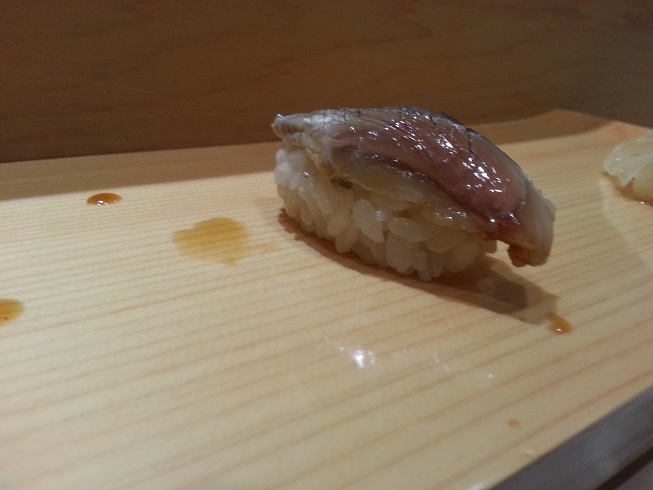 Then a wonderful piece of aji, or horse mackerel. Nice and oily, a perfect contrast to the previous piece. 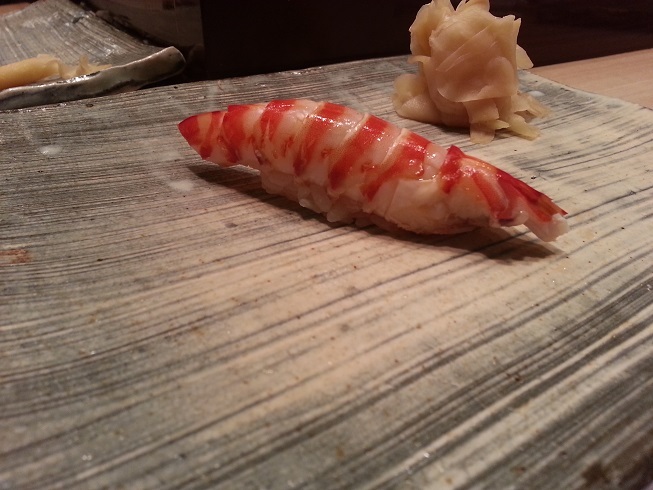 Next we move back to shellfish with a juicy and large ebi. This was a large and delicious piece, fantastic! Following this we stay with shellfish. 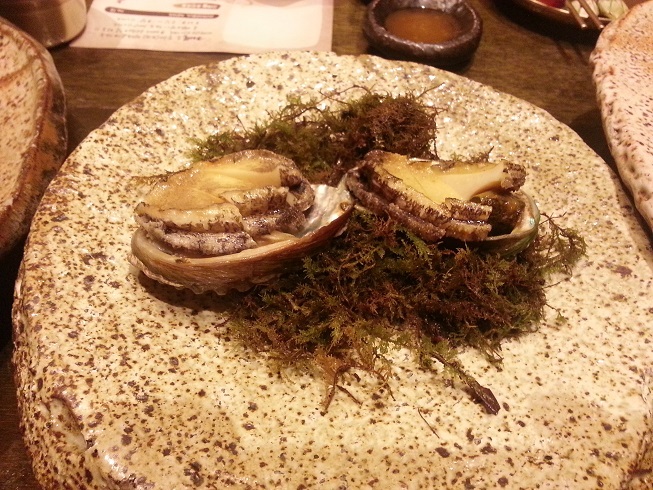 The akagai, or red clam, was delicious. I love the presentation here too. Utterly photogenic, and the texture was fantastic. 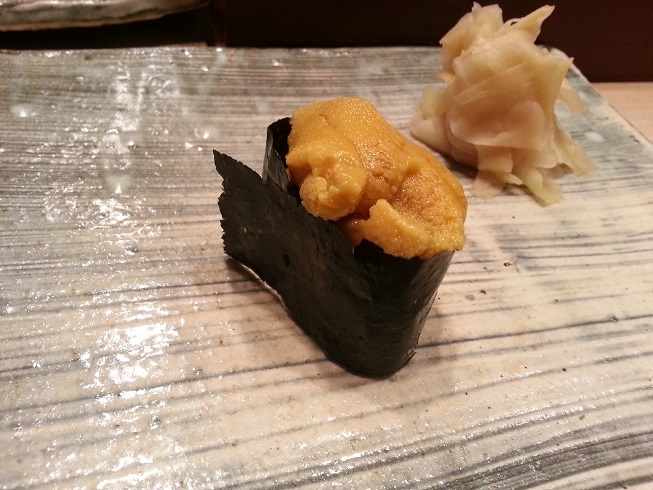 Uni was next on the omakase. To be honest this was nice but nowhere as nice as yesterday. There are some parts of this meal that was better than yesterday’s at Yasuda, but also parts of yesterday’s meal that’s been better than today — and this is one of them. Then we have seared tuna cheek…fantastic, really strong flavours here, and the searing brought it out fully. 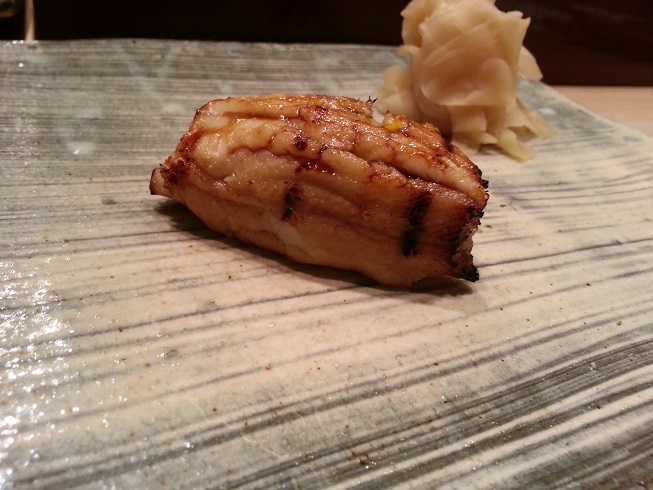 Next up was anago, and this was a really tasty item. I love my eels as everyone knows, so there’s no way to make it bad — especially how fresh this was. Nice! You know the meal was coming to an end when they give you the handroll, this was a simple tuna and scallion roll. Nothing special, it was better last night. 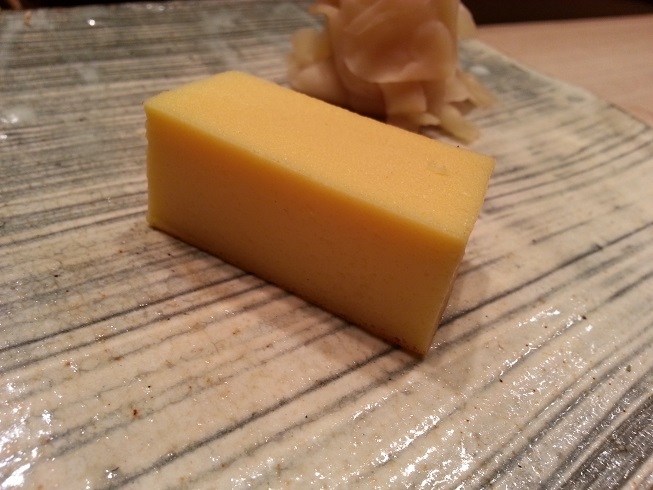 The first “extra” piece was an excellent mirugai. I love clams, so this was a real treat. 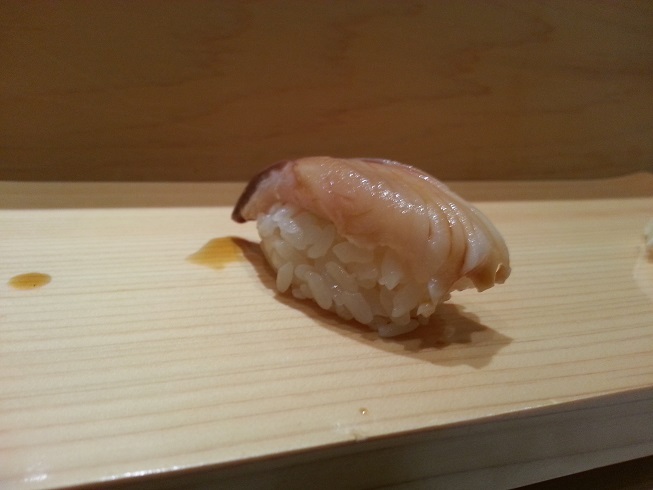 Very tasty, the cutting brought the crunchiness down a bit but really opened up the taste of this giant clam. Fabulous! Next up were squid tentacles. 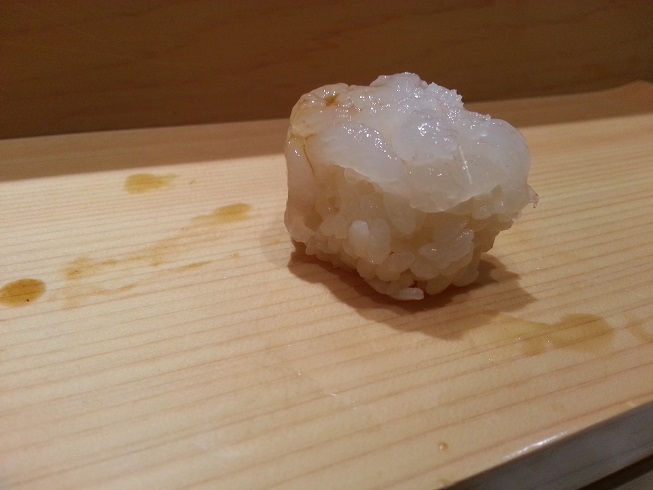 Beautiful presentation (like last night), I really like this hard-to-get item outside of Japan…not because it’s rare, but few sushi chefs good and patient enough to properly do this. I was a little shell-shocked when I got the bill, as it was more than double the bill from Yasuda (and I drank far less). But it was a wonderful experience. 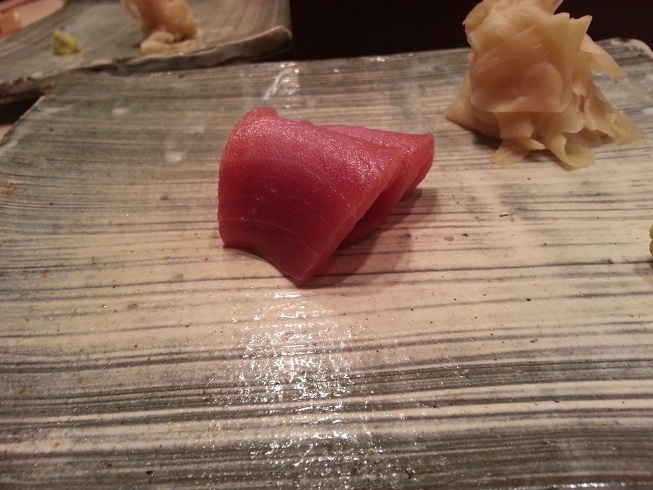 The tuna section was a particular gem tonight, as were some of the opening courses. I think the progression was better at Yasuda at times, but this was amazing. I headed out for the 20-minute walk back to my hotel, enjoying the cool breeze and savouring the experience of the evening. Fabulous food once again, and I started to wonder — can I eat sushi at a cheap place again? 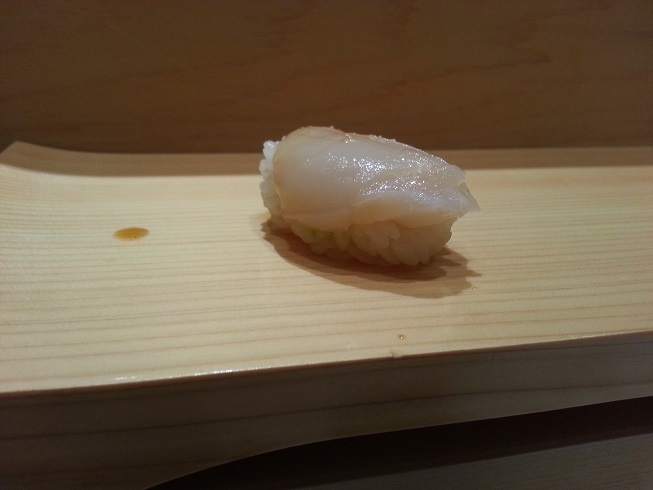 Or am I doomed to enjoy sushi only at pricey (but awesome) places? I made a booking before I left the US and looked forward to reuniting with Yasuda. It’s been over 5 years since I was at his station in the aforementioned NYC restaurant. I had gotten to the area by train a little early so dropped into a small Spanish winebar and enjoyed myself before getting to Sushi Bar Yasuda. 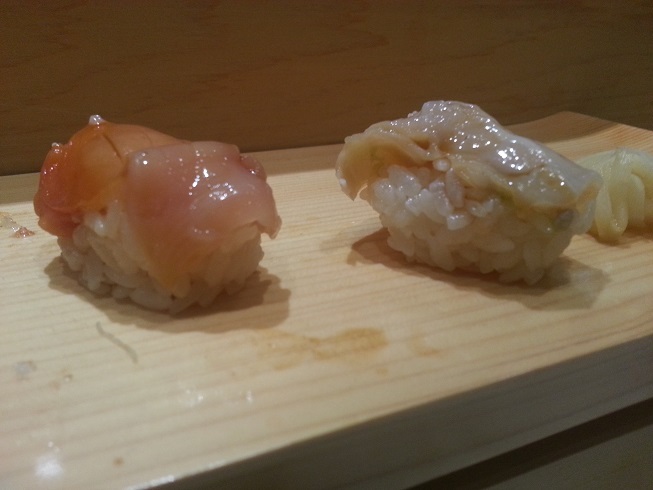 The place was in the basement of an office building, much like many of the top sushi places in Tokyo. 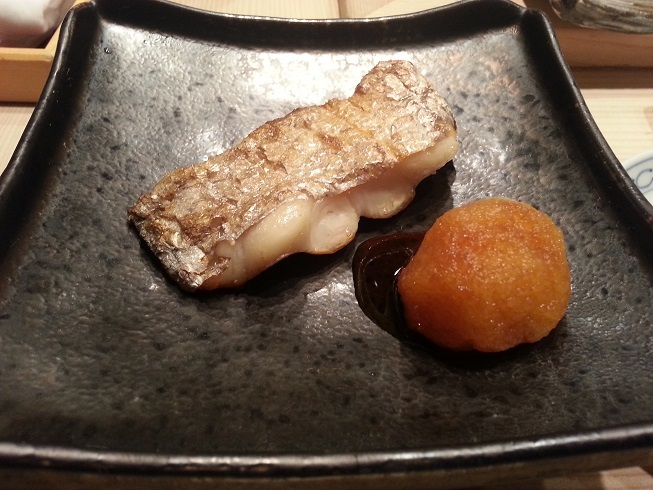 I walked down into the small, 8-seat restaurant and saw Yasuda already hard at work with his customers, joking happily. He looked tremendously happy to be working by himself behind the counter and laughing with his guests — which were all foreign. His English, he tells me, is both a plus and minus; he gets plenty of foreign guests (especially from NYC and after a recent Anthony Bourdain programme), but he is shunned by most Japanese (for the English language signs and so forth). 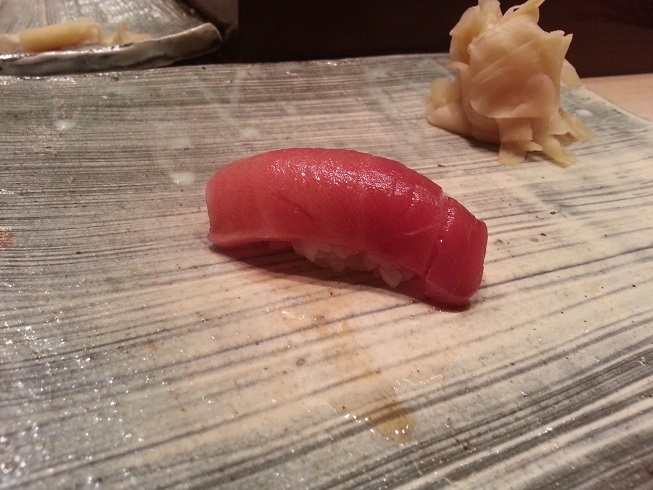 The rich buri was followed by a smooth piece of bluefin, hon-maguro, excellent counterbalance to the previous. Yasuda was also telling the customers as he made different items for different parties, about the fish, the sourcing, and more. He is really enjoying his role as story-teller, much more chatty than before. Maybe it was just how relaxed he looked and how me seems to enjoy this place? 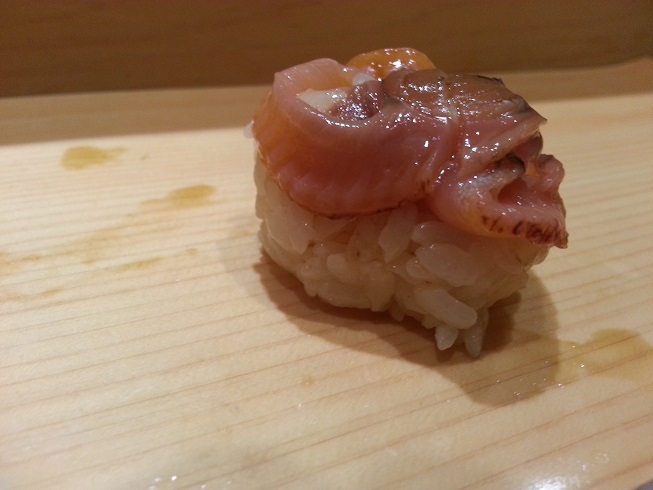 Next was a “chilly” trout…no idea what this is in Japanese, but it’s a specialty and quite hard to get. It was indeed rich and nice, not overwhelming. The balance has been good so far. 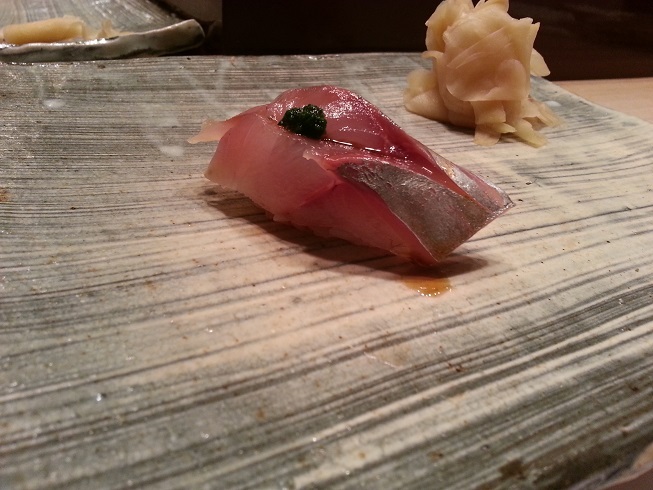 Next was a nice piece of mackerel, one of my favourites. 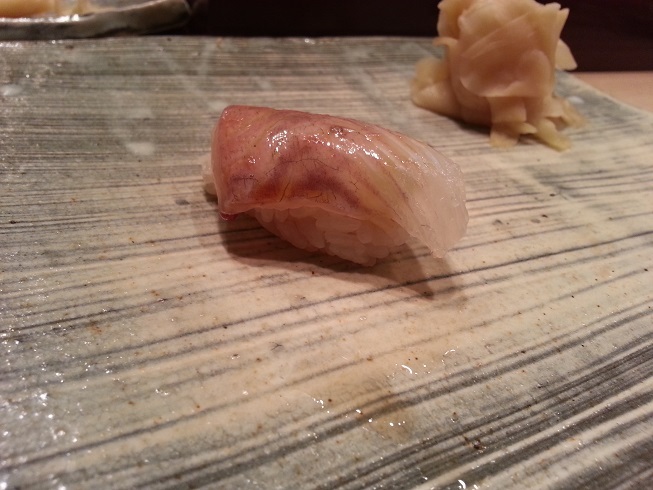 Yasuda knows I love saba and this was a solid and rich piece of the oily fish. Mmm… Balances well with the previous sweet shellfish. 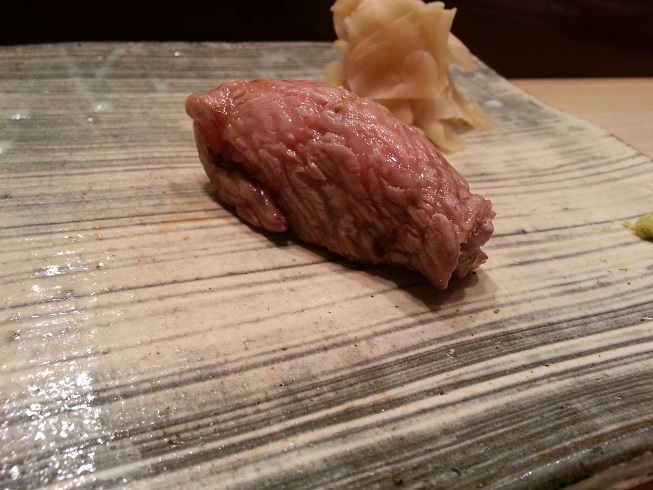 Sixth was a beautiful piece of o-toro, not extreme, but fancifully fatty. Rich and luscious, I actually prefer o-toro to chu-toro. Excellent. 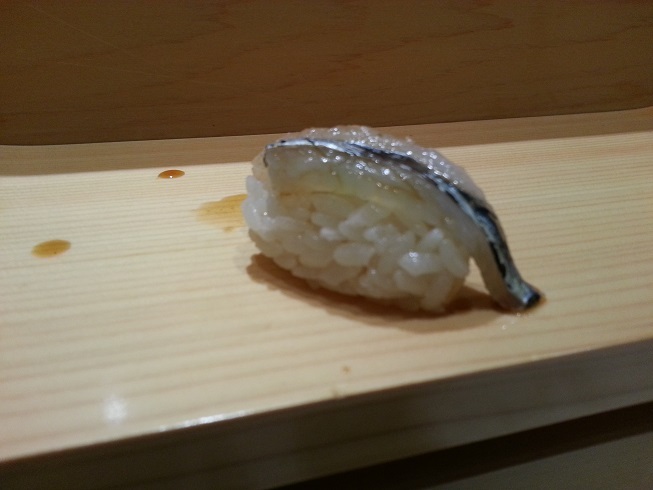 Lucky number seven remains with the oily fishes as he moved to a lesser-used sushi item, the sardine. 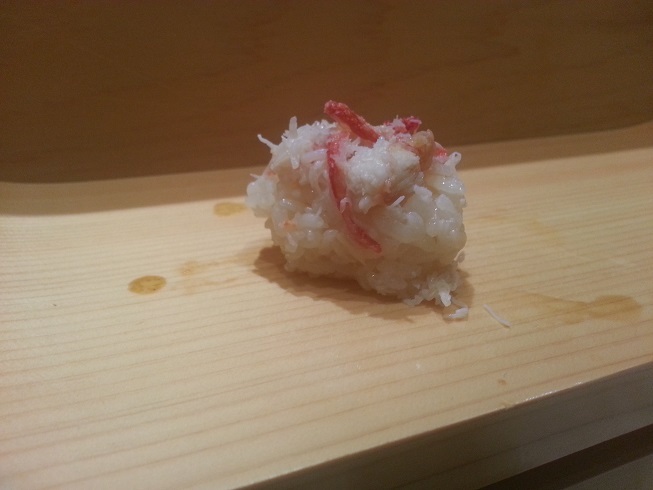 This piece of iwashi was rich as well, just what I liked. He knows what types of fish I enjoy! Then we move onto the halfbeak, or sayori, another fish you don’t get too often outside of Japan. Cool, smooth tasting. Yasuda was on fine form laughing and telling stories, now moving onto one about Bourdain when some guests from Singapore asked about it. He really is loving the banter! The follow-on switches gears a bit as he starts challenging me with pairs of different types of same items. First was a brilliant oyster. I wish I had taken down the names of these types of oysters, but this one was slightly briny but very plump. Excellent stuff. Then back to another oyster. This one was really plump, with a bit more brininess about it, but also rich as anything. Mmm…loving this meal! Next up was the bream. 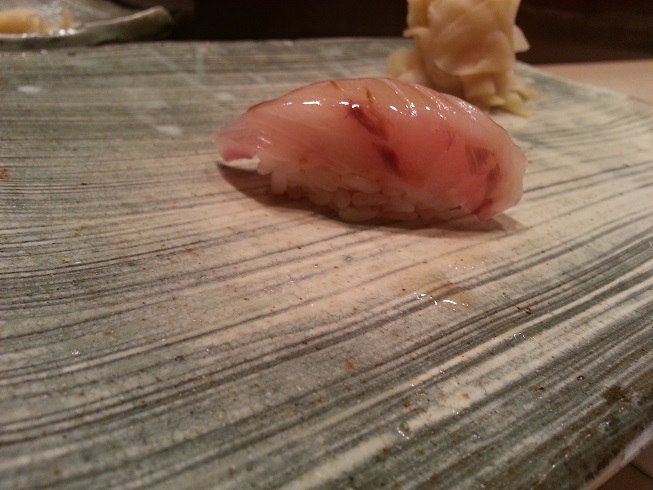 I think it was the red bream, but I am not sure. I’m not good with breams. Usually not one of my favourites, but this was a flavourful and strong piece that I really enjoyed. Following this was a departure. 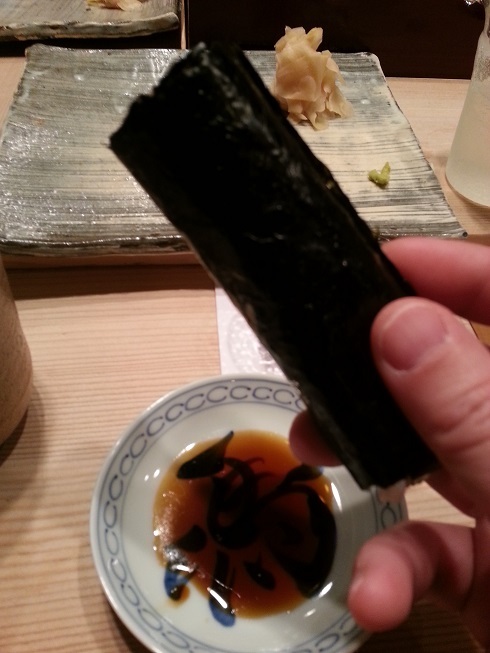 Yasuda was telling us about the very rare nori he acquired, usually not used for sushi because of its quality, so he wanted to show it off. 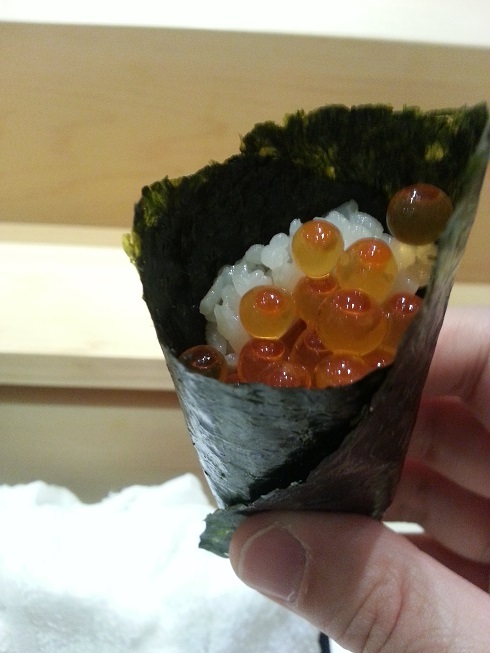 This is a ikura handroll. He cures the roe himself so it’s not crazy salty, and I told him it was his old place that I fell in love with ikura again because of the salting. The nori was, indeed, fantastic. Next was the white shrimp. A hint of sweetness, but it carried itself very well. 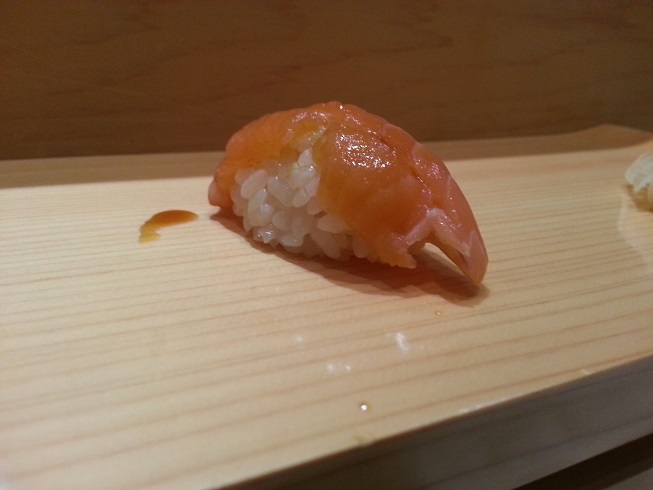 I am not an ebi eater usually for sushi as so often you get inferior ones (even fully raw), but this was quite fresh and excellent. 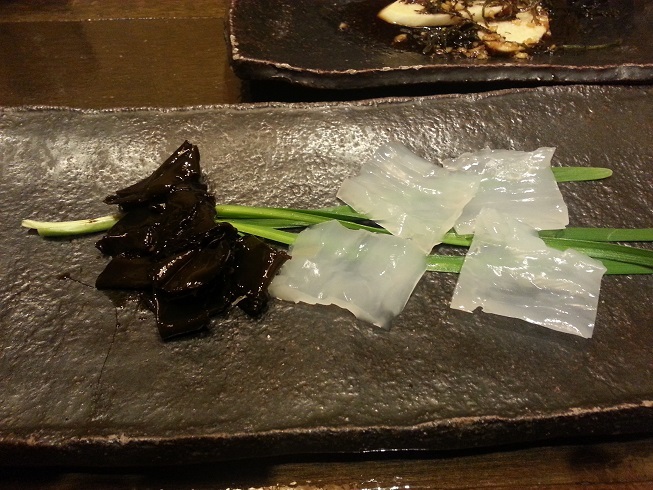 Following this soft item was something with a harsher texture, squid tentacles. A beautiful presentation, this is always one of my favourite items on the menu when I can get it. Solid stuff! 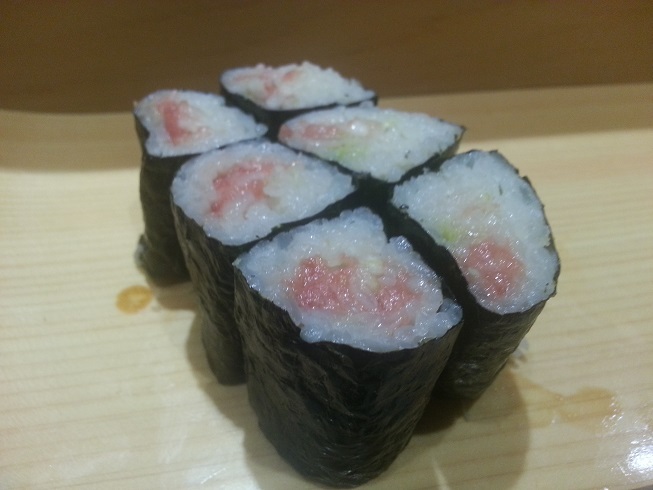 Yasuda brought out these brilliant tuna scallion rolls to focus on the fantastic nori and his excellent rice (sourced from his brother-in-law). I’m not a roll guy as my readers know, but these were a nice ending…or was it? Mmm…a battle of clams. 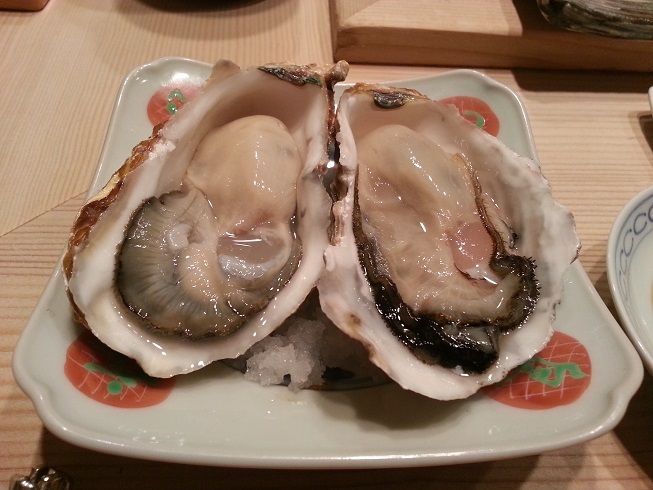 I love the differences in these bivalves, the texture and the flavour deep inside. Mmm, Yasuda knows what I like! He was nearly done cleaning the main sushi area, and I was done with the sake, so it was pretty much time to take my leave. I made sure I had a reservation to Satou before I even started on this trip. 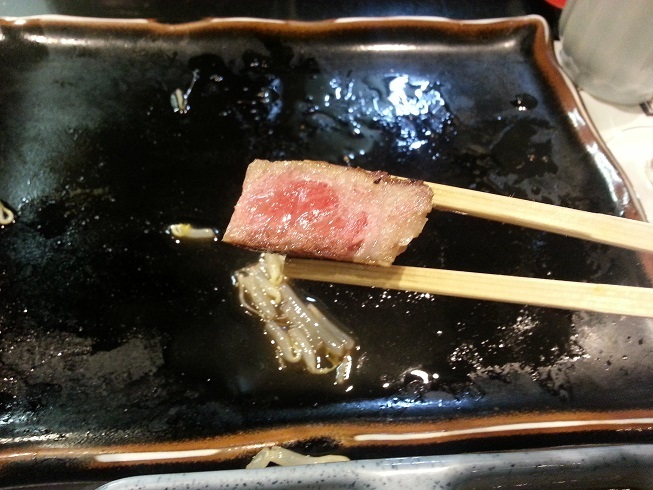 I have heard wonders about Matsusaka beef, and I had to have some whilst in Tokyo. Satou was a butcher and small steakhouse that specialised in this amazing beef, but was quite a long way from central Tokyo. I took my counter seat after dropping my coat into the basket under the seat — a very brilliant idea (place is too small for a coat rack), as the aroma of meat overwhelmed all senses (and attached to all clothing). The owner handed me the menu and just pointed at one thing, telling me it’s the best meat I’ll ever have. Wow…just look at this thing. 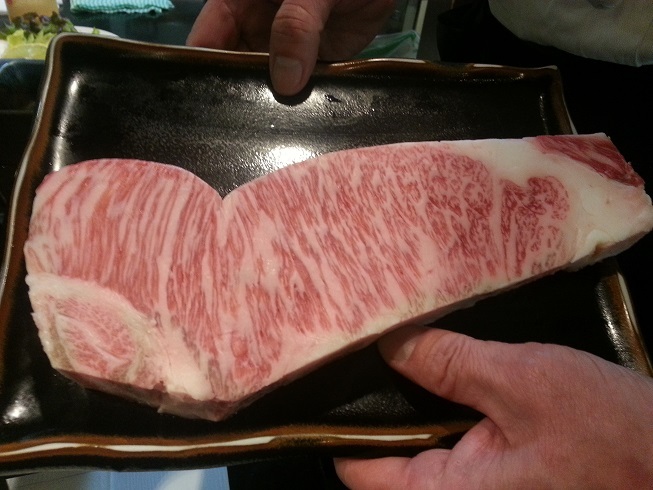 If you ever wondered about the amazing marbling, this is it… I was already drooling looking at this, to the approval of the boss. That first taste…oh my bloody goodness… No chewing required. This thing just melts in your mouth in a way that even a high-grade imported stuff cannot compare. The richness of the marbling just explains itself to you within seconds. The owner smiled at me as he took the plate away. The place was winding down so I had another beer and told him how good this was. It was cash-only, so thank goodness I had enough. Price was nowhere as bad as you’d imagine, the large amazing portion cost me exactly ten thousand yen (98 dollars, 72 euro, 60 quid). I wandered out for my long trek back to central Tokyo. This first night’s dinner was worth this long trip, this crazy jetlag, just about anything. I have never tasted anything so delicious in my life. Now I’ve had 2 of the most amazing meals of my life in the last 2 nights, just as the trip was starting to wind down. 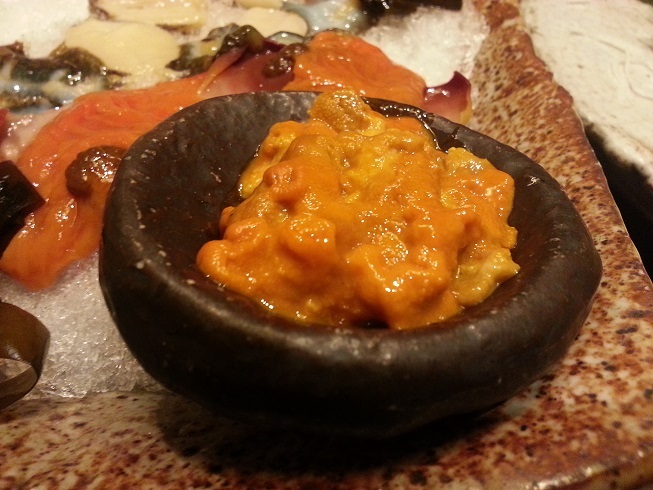 The meal began very relaxed with some fresh taro root in a very nice tangy sauce. 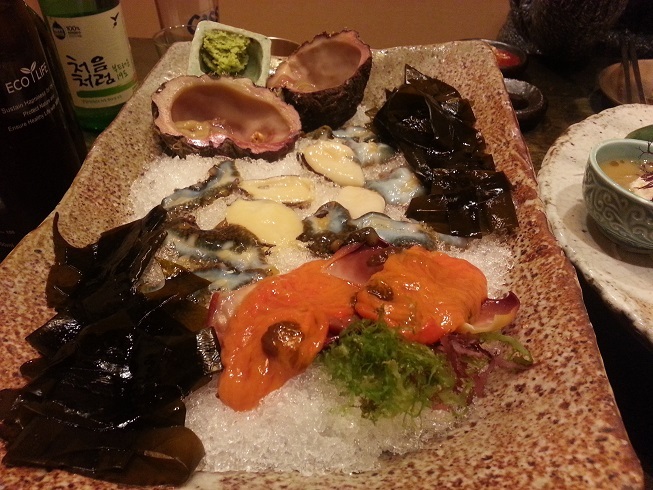 The seaweed was also very fresh and uncompromising. A nice start! Then we move totally to the sea on the next dish. 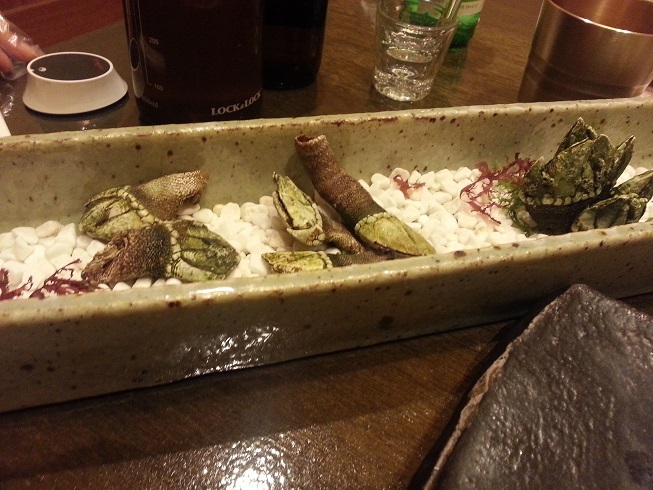 A wonderful serving of an unknown shellfish. 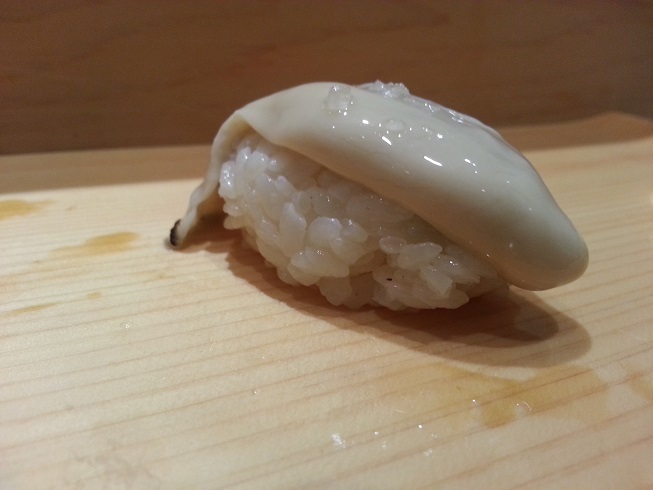 I thought at first it was rock octopus, but it tasted more like a clam. Again, more wonderful seaweed, which really tasted of the sea, fresh and crispy. Excellent! It keeps getting better! The feast continued. The restaurant is best known for its whale (don’t…I’ve made my case about this whilst in Iceland), and here’s a small tasting. The selection included belly, back, and fin. These pieces were rich and showed what the whale tasting (the restaurant’s name is actually “Whale Heat” and it is their main specialty) could have been. Very nice, rich and tasty. The fin was especially crunchy and interesting. 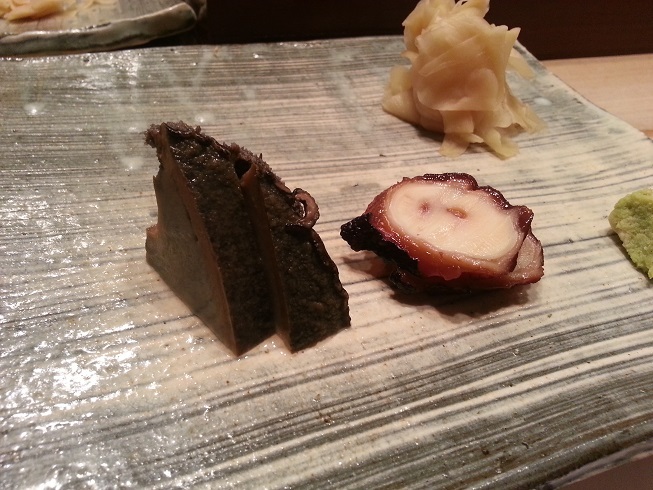 Then the last course came, the abalone. We were both totally full and the staff was actually wishing us to leave, because the mass exodus from Seoul for the Lunar New Year was happening. But we were full and appreciative of the wonderful food and the private room. My now new friend headed south from Gangnam as I headed north by train back across the river, still enjoying this amazing seafood feast. This was the most impressive tasting menu I’ve had for seafood…just awesome. If you are in Seoul, you really need to try this. If not in Seoul, you gotta go to Seoul for this!! !